Anyone else know what the rates are for the electricity they buy. Just saw this on ABSA when I bought some. 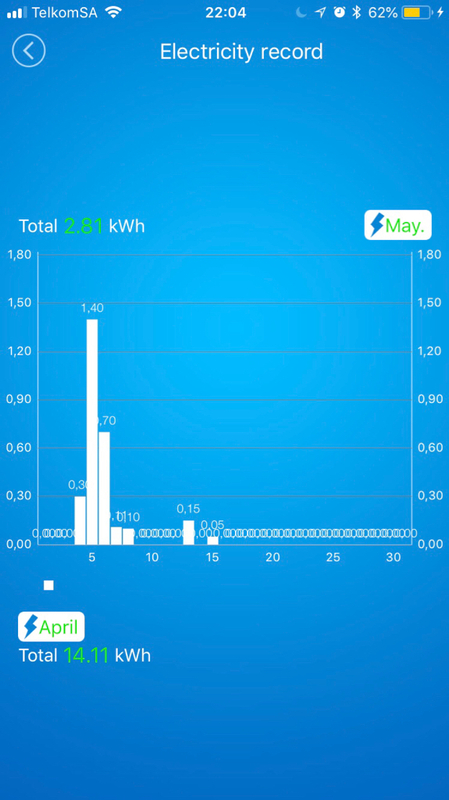 Roux, I currently buy 596.50 kWh a month. Thus all inclusive R1.9279 per kWh. Not in Stellenbosch anymore, moved to Somerset West a year ago so we fall under CoCT. Do you have a monitor similar to an extension cord? One end would be plugged into a wall socket and the other end would take a multiplug extension cable with TV, decoder, amp, android box etc. It would measures usage of that group of devices. Easy to unplug and move from room to room. You'll need 1 extension cord, 1 Sonoff Pow and some time. Using this to measure my lounge power. Yes, that would work, can just plug the extension cord in. Will check it out tks. Where do you see the usage? Can't see on their pics. Do you take a reading and then check 48 hours later? You have an app on your phone that shows you the current usage. Excuse the iPhone resolution. App isn’t 100% for iOS. Will contact them tomorrow, that's pretty useful and like I said I'm looking for an excuse to start a sonoff setup. I've been following the threads for a while. GeeWiz has one that's already cut and is basically plug and play. Five people in the house and usage goes from 35 to 45 per day. There must be somewhere we can cut down. Yea I've done exactly what was said said above : I took a multiplug and added a Sonoff POW (or R2) to check my use. 45 units a day? Even with 5 people in the house, are you constantly running baths? Is your pool pump going all the time? Is the fridge door being opened and closed all the time? I don't see how people could each use almost 10 units themselves a day. Yikes that's more then double what we use. Average we about 17 per day (2 adults 2 kids). 5 x TVs 24 hrs p.d. 2 x loads washing per day (same cleanliness maniacs wear a thick hoodie once then wash it). A+ rated Miele washing machine. 1 x dishwasher every 2 days. P.S. ordered one of those sonoff plugs from geewiz so we should get an idea soon of where the power's going. Computers could be using a fair chunk of that. Maybe turn those off?